Las entradas de puntos de bordado las encontraréis aquí. 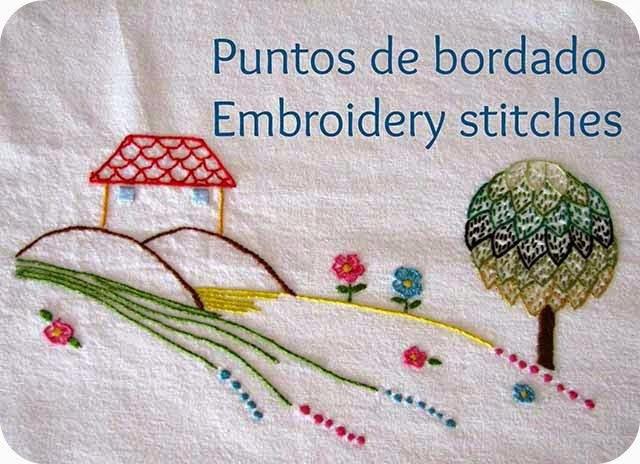 You can find the posts about embroidery stitches here. El punto de cordoncillo partido es un punto tanto de contorno como de relleno. Para un resultado adecuado es mejor utilizar un hilo trenzado, formado por hebras que no se separen. Puede ser de algodón, lana o seda. La aguja ideal es una crewell fina, para atravesar mejor el hilo. Con este punto se obtiene un precioso efecto volumen y unas líneas muy definidas. 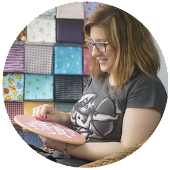 Split stitch is used for outlines but it is a filling stitch too. For a best result it's better to use a plaited finishing thread, formed by several fibers which do not separate. And we can use cotton, yarn or silk thread. 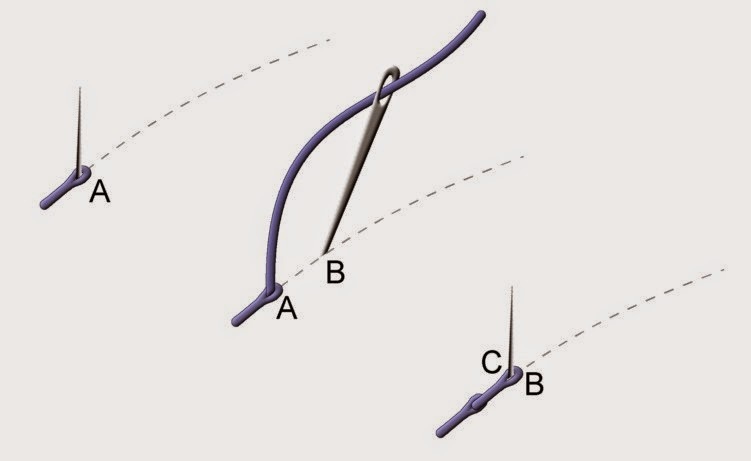 A fine crewell needle is perfect to split the thread cleanly. With this sitch we obtain a nice relief and well defined lines. Bordamos de izquierda a derecha, sacando la aguja por A e introduciéndola por B. Volvemos a sacar por C, atravesando el punto anterior por el medio. Working from left to right, bring the needle up at A and down at B. 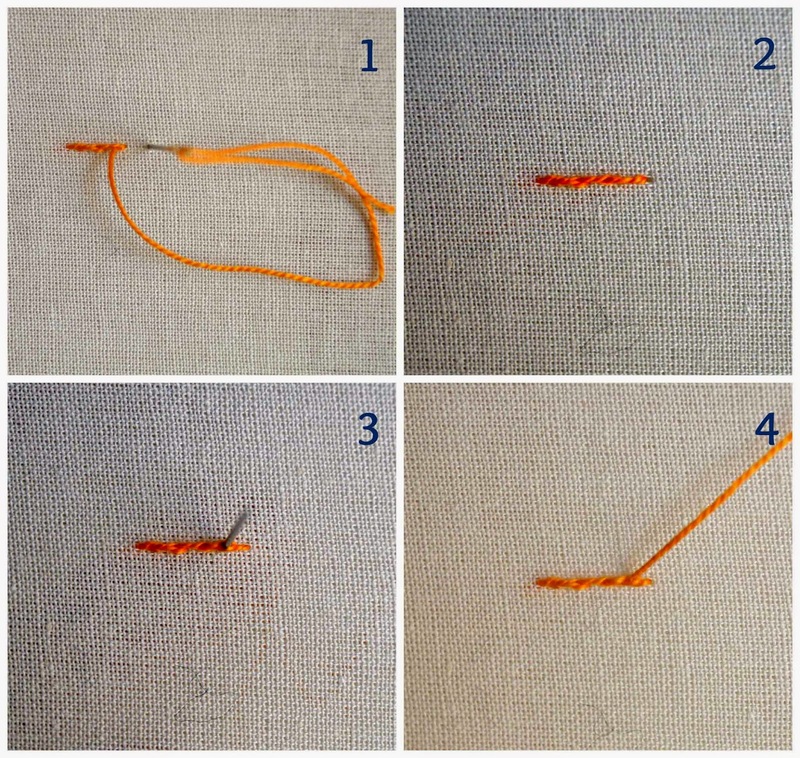 Bring the needle out at C, splitting the first stitch in the middle.